Introduction: Diet plays a major role in the etiology of dental caries. The physical properties of food can affect its retention on tooth surfaces, and its oral clearance. Aim: The aim is to determine the physical properties of foods that are commonly consumed in India by children aged 3–6 years and to ascertain the frequency of their consumption. Materials and Methods: Texture profile analysis of solid foods and viscosity of liquid food samples was performed. 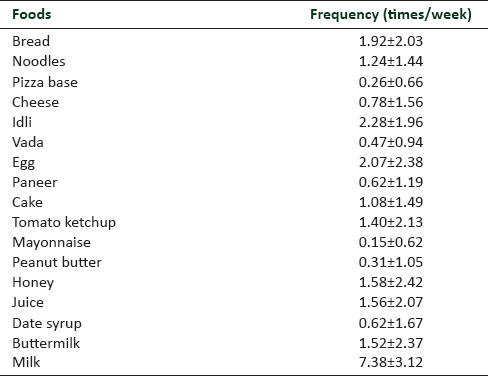 A questionnaire was used to assess the frequency of consumption of these foods. Results: Among the solid food samples, cheese had the highest hardness (157 ± 20.8 N), chewiness (82 ± 10.4 N), gumminess (82 ± 10.4 N), and adhesiveness (11.2 ± 2.4 Nmm). Noodles had the least hardness, cohesiveness, gumminess, and chewiness. Among the liquid food samples, peanut butter was the most viscous (21 Pas) and milk was the least viscous. Milk had the highest pH (6.3) and fruit juice (3.5) had the lowest pH. Conclusion: The physical properties and texture of food can be considered to be a risk factor for evaluating the relationship between food retention and dental caries. This information can further be used as an educative tool to parents and caregivers for effective modification of diet. Dental caries is known to be multifactorial in origin with diet playing a major role in the development of caries. The characteristics of foods that have an increased potential for causing tooth decay are: Texture (the consistency of foods), taste, carbohydrate content and composition, prolonged retention (rinsing or clearance), intake during or between meals, protective factors (casein and phosphates), and frequency of consumption. Several studies have assessed oral clearance, pH changes in the oral environment and carbohydrate content of food.,,,, The inherent properties of food that make it cariogenic have also been researched., Most of these studies have been conducted on dietary foods consumed by the western or European population., Information on the physical nature of foods that are available and consumed in India is lacking. Studies on cariogenicity of diet give importance to their sugar content.,, Retentive, sticky foods may be potentially more cariogenic than foods that are cleared rapidly from the oral cavity. Retention of food in the oral cavity for prolonged periods increases the potential of starch to break down into sugars. This may accentuate demineralization of teeth further increasing the risk of dental caries. Caldwell's comprehensive summary of physical, chemical, physiological, and anatomic factors involved in the retention and clearance of food from the mouth showed that the physical and chemical factors of food caused intraoral food retention and delayed clearance. These inherent properties of food that make it adhere to the teeth are seldom given importance. Hence, this study determined the physical properties of foods that are commonly consumed in India by children in the 3–6 years age group. The frequency of consumption of these foods was also assessed. Foods that are regularly consumed at Indian homes were shortlisted with the help of a food diary distributed to the parents of school children in Bengaluru. From this list, only foods that could be tested using equipment for analysis of the physical properties were selected. 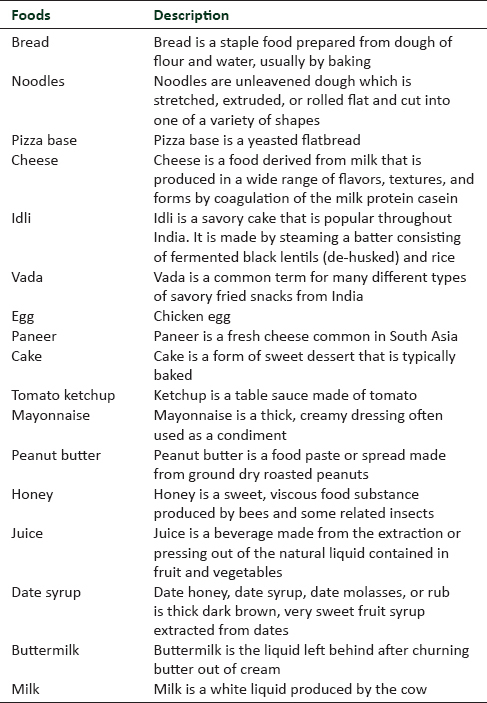 A list of 17 foods was prepared [Table 1]. They included food items that are commonly served at homes for breakfast or at meals and prepared by various methods such as frying, baking, steaming, and boiling. A few of these items are frequently packed in lunch boxes of school children. Analysis of physical properties of these foods was performed. Texture profile analysis of the solid foods and viscosity of the liquid foods was conducted at Central Food Technological Research Institute (CFTRI), Mysore. The pH assessment for the liquid food samples was also done. The solid food samples tested for the assessment of physical properties were bread, pizza base, cheese slice, cottage cheese (paneer), slice of cake, idli, vada, noodles, and boiled egg. The height of all the solid food samples was standardized at 13 mm. A Texuturometer LR5K (Lloyd instruments) was used with a load cell of 1 kN and at a speed of 50 mm/min. A probe of 80 mm diameter was used to carry out a compression test to assess the primary physical properties of these samples, namely, hardness, cohesiveness, adhesiveness, and the secondary properties of chewiness and gumminess. The liquid food samples assessed for viscosity and pH were milk, buttermilk, date syrup, honey, tomato ketchup, fruit juice, mayonnaise, and peanut butter. Viscosity was measured for these samples using Viscometer– RI:3:M (Rheology International) at a temperature of 25°C. A volume of 100 ml of each sample was taken in a beaker and the spindle was inserted and rotated at the designated speed of 50 rpm. Each sample was evaluated 10 times and the mean value was recorded in pascals. The pH of the liquid samples was measured using a digital pH meter (pHep – Hanna Instruments India) at a temperature of 25°C, immediately after opening or on freshly preparing the product. The electrode was calibrated before measurements using the standard buffers of pH 7. Measurements were repeated in triplicate for each sample. The frequency of consumption of these foods was assessed with the help of a questionnaire over a period of 1 week given to mothers of children aged 3–6 years (mean age of 4.4 ± 3.8 years) and studying at various preschools of Bengaluru. Only those questionnaires that were complete were analyzed for frequency of consumption. Data were tabulated and subjected to statistical analysis using Mann–Whitney U-test. Among the solid food samples tested for physical properties, cheese showed significantly higher hardness (157 ± 20.8 N), gumminess (82 ± 10.4 N), chewiness (82 ± 10.4 N), and adhesiveness (11.2 ± 2.4 Nmm) compared to all other food samples; whereas noodles was observed to have the least hardness (7.5 ± 1.2 N), gumminess (1.9 ± 0.4 N), and chewiness (1.9 ± 0.4 N). The lowest value of adhesiveness was recorded for pizza base (−0.3 ± 0.3 Nmm), which was significantly lower than that of cheese, idli, and vada. Cottage cheese (paneer) showed the maximum cohesiveness (0.6 ± 0.04) and pizza base (0.3 ± 0.01) had the least cohesiveness value [Table 2], [Table 3], [Table 4], [Table 5], [Table 6]. Among the physical properties tested for liquid food samples, peanut butter showed the highest viscosity (21 Pas), whereas milk was seen to be the least viscous (0.00126 Pas). The highest pH was recorded for milk (6.3) and the least for fruit juice (3.5) [Table 7]. Milk was the most frequently consumed food sample and mayonnaise was the least frequently consumed food [Table 8]. A direct and consistent relationship exists between diet and caries experience. The texture is one of the most important characteristics of foods that varies for each type of food. Food texture is defined as all the rheological and structural (geometric and surface) attributes of a product perceptible by means of mechanical, tactile and where appropriate, visual, and auditory. In this study, foods with increased values for hardness, chewiness, and gumminess were considered to be beneficial due to the increased effort made by the muscles for their mastication, which in turn will be beneficial for growth and development. Moreover, the development of dental caries is known to be greatly affected by food hardness. Hard and coarse foods can exert a detergent activity during mastication, which is effective in the prevention of caries. It is postulated that the soft diet of modern society lacks the physical properties that require vigorous chewing; thereby leading to more caries-susceptible tooth enamel. A higher value of cohesiveness indicates that a food can be compressed to a higher degree between the tooth surfaces before it breaks and therefore, sticks lesser to the teeth. Hence, a lower value of cohesiveness was considered to be more detrimental to dental health. Although pizza base was significantly less cohesive compared to most of the foods, it had the lowest adhesiveness, making it less sticky. Adhesiveness is the work necessary to overcome the attractive forces between the surface of the food and the surface of the teeth. Thus, a higher value of adhesiveness indicates an increased amount of stickiness to teeth. Adhesiveness and cohesiveness values for the cake were similar to that of bread. Interestingly, the other physical properties of cake indicated that it requires more of mastication. The soft texture of noodles makes it a popular choice among children. Due to its significantly low gumminess and chewiness, noodles can be consumed easily, without much masticatory effort. However, the cohesiveness of noodles was found to be the least, thus increasing the likelihood of it sticking to the teeth and resulting in delayed intraoral clearance. Both cheese and cottage cheese (paneer) are dairy based products proven to be beneficial to teeth as caries protective agents. In comparison to milk and yoghurt, cheese has been shown to have the highest anti-cariogenic property and maintains an elevated plaque pH for a longer time. Low salivary pH levels due to a chocolate challenge was seen to be reversed with cottage cheese (paneer). The salivary pH levels were elevated for 60 min indicating that the protective effect of cottage cheese (paneer) lasted for over an hour. Cottage cheese (paneer) showed maximum cohesiveness, and its gumminess and chewiness were only lesser than that of cheese, thereby making both of them more favorable to dental health. “Idli” and “vada” are widely eaten traditional preparations of South India and are made from pulses and cereals. While “idli” is a steamed preparation eaten more often, “vada” is a fried crispy preparation usually eaten only on occasions or festivals. The lower hardness, gumminess and chewiness of “vada” indicated that it is easy to chew. However, its adhesive and cohesive properties were similar to that of idli, thus increasing its retention on tooth surfaces. The acidic potential of a food product can be measured and expressed as pH values. Any food that is acidic in nature can contribute to demineralization of dental hard tissue if consumed frequently and over a prolonged period., Viscosity describes the flow behavior of liquids. Hence, less viscous liquids have more fluidity and tend to have a faster oral clearance rate with low adherence to the tooth surface. Tomato ketchup was the preferred choice of dip to many foods including bread, noodles, and pizza due to its palatability. The low pH and higher viscosity of ketchup can be a possible cause for increased oral retention and dental erosion. In this study, children were found to consume tomato ketchup at least 1–2 times a week. Frequency of consumption was seen to be most among 5-year-olds probably due to change in their food preferences. Honey and date syrup are commonly used as sweeteners in many Indian food preparations. In this study, honey was more frequently consumed as compared to date syrup. It was observed that date syrup had a higher viscosity and a lesser pH as compared to honey indicating a lower oral clearance rate. From a dental health perspective, honey appears to be a better choice over date syrup. In this study, the most viscous of the food products tested was peanut butter. It had a relatively higher pH when compared to mayonnaise, which was least frequently consumed. Individual samples of food tested in this study may be consumed either in a similar physical unchanged form and/or in combination with other food products, which may alter its physical properties. Hence, the properties of each component per se can have a cumulative effect on the cariogenicity of the food itself. In 3–6-year-old children, the most frequently consumed food was milk and mayonnaise was the least frequently consumed food.! In addition to nutritive value and presence of sugars in foods, their physical properties should also be given importance. The authors would like to acknowledge CFTRI, Mysore for the technical assistance in this study. Miguel A, Sanz G, Aurora B, Nieto G, Nieto EG. Dental health: The relationship between tooth decay and food consumption. Nutr Hosp 2013;28:64-71. Pollard MA, Imfeld T, Higham SM, Agalamanyi EA, Curzon ME, Edgar WM, et al. Acidogenic potential and total salivary carbohydrate content of expectorants following the consumption of some cereal-based foods and fruits. Caries Res 1996;30:132-7. Wong A, Young DA, Emmanouil DE, Wong LM, Waters AR, Booth MT, et al. Raisins and oral health. J Food Sci 2013;78 Suppl 1:A26-9. Bhat SS, Reddy VV. Effect of consumption of commonly available fresh fruits in Karnataka on the hydrogen ion modulations of human dental plaque. J Indian Soc Pedod Prev Dent 2001;19:27-37. Masih U, Joshi JL, Mahay P. A comparative study of acidogenic potential of milk and commonly used milk formulae. Int J Dent Clin 2010;2:30-2. Preethi BP, Maitryee DS, Dodawad R. Effect of four fruit juices on pH of dental plaque-A four year crossover study. J Clin Diagn Res 2010;3:2587-93. Szczesniak AS. Texture is a sensory property. Food Qual Prefer 2002;13:215-25. Caldwell RC. Physical properties of foods and their caries-producing potential. J Dent Res 1970;49:1293-8. Evans EW, Hayes C, Palmer CA, Bermudez OI, Naumova EN, Cohen SA, et al. Development of a pediatric cariogenicity index. J Public Health Dent 2013;73:179-86. Ismail AI. Food cariogenicity in Americans aged from 9 to 29 years assessed in a national cross-sectional survey, 1971-74. J Dent Res 1986;65:1435-40. Saeed S, Al-Tinawi M. Evaluation of acidity and total sugar content of children's popular beverages and their effect on plaque pH. J Indian Soc Pedod Prev Dent 2010;28:189-92. Cho B, Lee H, Lee E, Lee C. The relative caries potentialty index according to the sweetness and the viscosity of several beverages. Int J Clin Prev Dent 2014;10:157-63. Caldwell RC. The retention and clearance of food from the mouth. Ann N Y Acad Sci 1968;153:64-70. Bourne MC. Texture profile analysis. Food Technol 1978;32:62-6. Das AK, Babylatha R, Pavithra AS, Khatoon S. Thermal degradation of groundnut oil during continuous and intermittent frying. J Food Sci Technol 2013;50:1186-92. Manipal S, John J, Saravanan S, Arumugam IM, Kumar P. The effect of different beverages on salivary pH in 12 year old school children in Chennai. J Orofac Res 2013;3:166-9. Nakahara Y, Sano T, Kodama Y, Ozaki K, Matsuura T. The effect of food hardness on the development of dental caries in alloxan-induced diabetic rats. J Diabetes Res 2013;2013:787084. Telgi RL, Yadav V, Telgi CR, Boppana N.In vivo dental plaque pH after consumption of dairy products. Gen Dent 2013;61:56-9. Tayab T, Rai K, Kumari V, Thomas E. Effect of chewing paneer and cheese on salivary acidogenicity: A comparative study. Int J Clin Pediatr Dent 2012;5:20-4. Carvalho SH, Magalhaes AC, Machado M, Buzalaf M. Evaluation of the erosive potential of soft drinks. Eur J Dent 2007;1:10-3. Jager DH, Vieira AM, Ruben JL, Huysmans MC. Estimated erosive potential depends on exposure time. J Dent 2012;40:1103-8.
de Almeida LD, Abílio GM, Cavalcante MT, Castro RD, Cavalcanti AL. Cariogenic and erosive potential of industrialized fruit juices available in Brazil. Braz J Oral Sci 2015;9:351-7.
de Melo MA, Passos VF, Lima JP, Parente GC, Rodrigues LK, Santiago SL, et al. Erosive potential of processed and fresh orange juice on human enamel. J Dent Child (Chic) 2015;82:10-5. Al-Dlaigan YH, Shaw L, Smith A. Dental erosion in a group of British 14-year-old school children. Part II: Influence of dietary intake. Br Dent J 2001;190:258-61.